Sebastian Niemann's fast-paced adventure thriller Jesus Video, based on Andreas Eschbach's international best-seller of the same name, is a first on several counts. To begin with, it is the first production by Christian Becker and Anita Schneider's new outfit Ratpack Filmproduktion; the first project to be backed by the media investment fund German Film Productions (GFP); ProSieben's first in-house two-parter and also screenwriter Martin Ritzenhoff's first foray into the thriller genre from comedy. 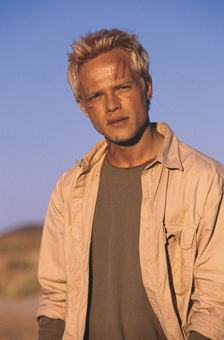 Niemann, who had previously worked with Becker on the mystery TV movie Das Biikenbrennen - Der Fluch des Meeres (1999) and the English-language feature 7 Days To Live (2000), became curious after reading the hardback edition's blurb. A year or so later, producer Becker came to him with the offer to direct an adaptation for television and Niemann didn't hesitate in accepting. "I liked the idea of two parts because you then have the chance to be broader in your storytelling and for the whole story to be expanded", Niemann explains, "It was an interesting challenge - and a completely new experience for me - to tell a story over three hours". Budgeted at Euro 4.45 million, the production also features Ornella Muti's daughter Naike Rivelli as Steffen's feisty love interest Sharon, who helps him out of many a tight spot, and was shot on location at Ouarzazate - partly using the sets from The Bible series - and Casablanca in Morocco.